Recently, it was my turn to have a few guests over for an informal drink and snacks. 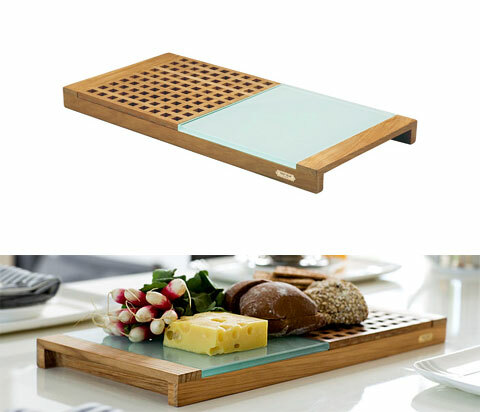 When I saw this tray I knew that I had the solution for a perfect and very suitable menu – wine and cheese board. 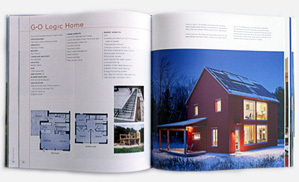 The compact design is ideal for that casual gathering around the coffee table, in the garden or on the balcony. Beautifully crafted teak wood is the basic material used to make this innovative ‘Triton 2’ tray by Skagerak of Denmark. Their policy of manufacturing useful, practical and durable items, more than shows itself in this universal kitchen utensil. 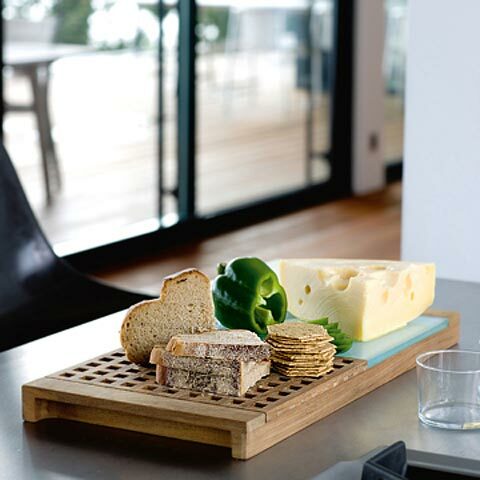 Triton 2 elegantly unites a chopping board, serving platter and tray in one product, and is ideal whenever bread, cheese and good wine are on the menu. The teak and glass look good together and are very easy to clean and maintain. The internal tray that catches all the crumbs slides out for easy emptying. This multi purpose utensil serves as an ordinary serving tray; a cutting grill (for crumbs to fall through) while the glass plate turns the Triton 2 into a buttering board or a serving dish. The size is plenty large enough to make a very attractive presentation and looks great on the buffet table, offering a selection of cheeses, crackers and various breads. ‘Designit’ are the designers and they work very closely with Skagerak of Denmark to combine the traditional with the modern in both the design and the materials used. A perfect serving solution that I am sure would also make a great gift for people who love to entertain.